The news (well ok, Twitter) has been full of angst and panic this week about the discovery of horse meat in burgers. There have been two main concerns. First, some people seem to think that horses are special and clever and, despite the fact that it’s legal and widely consumed in the rest of the world, they shouldn’t be eaten. To this, I have one simple counter-argument. Horses are dumb. Horses are dumber than cows. Cows aren’t dumb enough to let us sit on them. We eat cows, therefore we should eat horses. QED. The second concern has more legitimacy – it’s an issue of labelling. If the burgers had simply said “may contain Dobbin” on the box then there would have been no problem. Why is this on a drinks blog, you ask? Well, it got me thinking about the importance of labelling, and after extensive testing I’ve made some disturbing discoveries that not only are some products failing to list all their ingredients, others make misleading claims about ingredients that simply don’t appear. Firstly, Red Horse Beer from the Philippines. 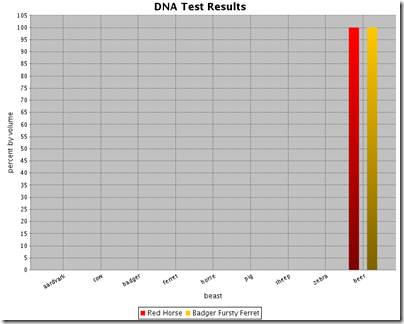 Tasty it may be, but there is absolutely no detectable horse DNA, of any colour. Disturbing, but hardly the worst offender. Badger Ales Fursty Ferret should be a veritable smorgasbord of tasty British wildlife but no, no sign of badger and no sign of ferret. Just tasty, malty beer. Bastards. 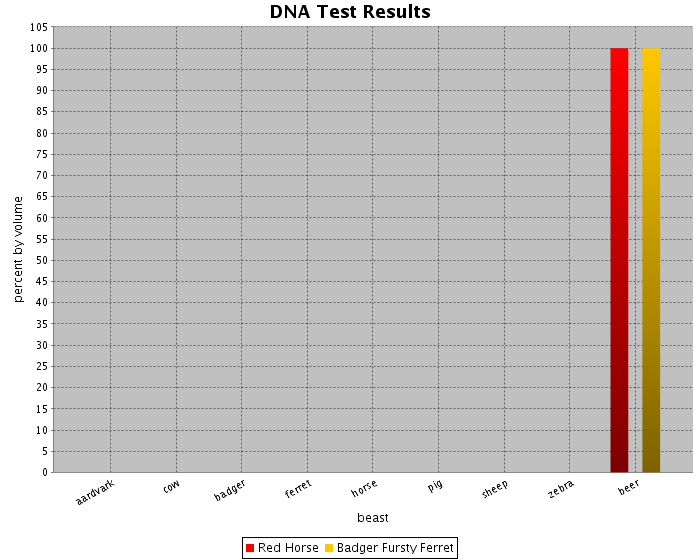 The example from Badger shows that it’s not just the beers, but the breweries themselves. No beer from Badger Ales has any badger in it. The Concrete Cow Brewery is even worse – their beer has neither cows nor concrete in it. As drinkers, we should demand what we are promised. I call on all breweries to add more tasty animals to their brews, or stop teasing us with these false promises!